July was a really slow reading month for me with only 6 books completed (or 949 pages + 24.5 hours of listening). But I still managed to find some gems including debut novel THE DRY from Jane Harper. 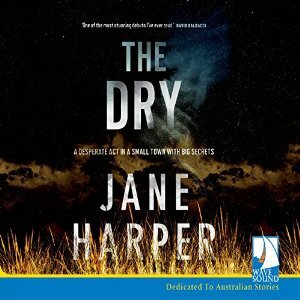 Anyone who’s lived through drought will feel the authenticity of Harper’s setting – a small Australian town at the mercy of the weather – and there’s a great story and characters to back it up. The story starts with the apparent murder suicide of a local farming family before revealing layer upon layer of secrets. If you happen to be an audio book fan I highly recommend the narration by voice artist Steve Shanahan: a complete treat. anything with an asterisk is worth a read. I’m going over-the-top with my personal challenge to participate in at least 6 Crimes of the Century challenges and am really enjoying it so will keep going. I’ve got another Arthur Upfield title lined up for August (which is focusing on the year 1954, why don’t you join in?). I like that I’m getting motivated to track down Australian titles. I think now I should be able to finish the Reading USA Fiction challenge this year with only 2 books to go and 5 months in which to find them. Though at this stage I think it’s going to take me a couple of decades to make my way virtually around the US. I’m not having too much trouble staying away from Girl books either. That leaves my AWW challenge and reducing my TBR looking like the only shaky bookish goals left. August will be no less chaotic in my non-bookish life than July was so I doubt I’ll get on top of either goal this month. But we’re supposed to be having fun here right? So I’m not really all that bothered. I’ve got a load of Australian titles staring at me from the nightstand…including some review titles I promised to take a look at. I should also be getting stuck into Peter May’s COFFIN ROAD for my book club. I like Peter May’s writing so I don’t know what’s putting me off getting hold of a copy. Aside from the fact I still have as many unread books in my own possession as I did at the start of the year (of the 53 books I’ve read so far this year only 12 of them were ones I owned before 1 January, I ought to be slapped). And then there’s the book that’s been troubling me – forcing me to confront some things about myself that I’d rather not confront. I mentioned I had started it during last month’s Books of the Month wrap up and I’ll admit I set it aside for a couple of weeks before deciding to re-start it. I don’t mind giving up on a book that isn’t good or isn’t to my taste, but I’m less comfortable doing so simply because I don’t like what my reaction to a book says about me. So you’ll be hearing about this one shortly. What about you? Did you have a great read during July? Anything good coming up for August? It seems to be literary awards season the world over, does that affect your reading? This entry was posted in A.E. Martin (Aus), books of the month, Deborah Johnson, Ellery Adams, Jane Harper (Aus), Roger Monk (Aus). Bookmark the permalink. When it comes to reading, Bernadette, it’s quality, not quantity, if you ask me. And I’m glad to hear that there were more reads you really enjoyed than disappointing reads. You’re making real progress on your reading goals, too. I admire you for setting those goals; I often feel I ought do more of that sort of thing myself. I am trying to ignore my tottering TBR pile…you must read Between a Wolf and a Dog – Georgia Blain and The Summer that Melted Everything- Tiffany McDaniel- beautifully written books. Both The Bank Manager and Common People sound very good. I will look out for those books. The Dry and he Bank Manager I’m adding to the over-the-top TBR list. July best reads: Sadly, I finished May’s Lewis Trilogy with the Chessman. I miss the Outer Hebrides already. I am going to order Coffin Road from the Book Depository which has it. I enjoyed Ann Cleeves’ The Moth Catcher, her latest Vera Stanhope book, and my first time reading any of her books. And The Quality of Silence about a hearing disabled child with her astronomist mother driving across Alaska.